Having a horn on your car, truck, SUV, minivan, or motorcycle is pretty much taken for granted. However, horns are a serious component for motor vehicle safety especially when you need to warn another car, or pedestrian, bicyclist, or motorcyclist of danger. Honking your horn is an automatic reaction for most drivers; you hit that horn and sound a loud warning. Is There a Florida Statute Related to Motor Vehicle Horns? 1. All motor vehicles that drive on a Florida highway must have a horn in good working order. Horns cannot be tricked-out to give off strange and bizarre sounds — that warning honk from a horn must be readily recognized by the public in order to successfully warn people immediately of danger. It’s illegal to change a car horn so it has a unique whistle or plays a part of a favorite song. A driver who violates Florida Statute 316.271 is considered to have violated Florida law in the form of a non-criminal traffic violation and can be ticketed for a non-moving violation under Florida traffic laws (Florida Motor Vehicle Code Chapter 318). Additionally, laying on your horn when you’re frustrated can be interpreted as evidence of road rage. In Florida, that’s frowned upon by traffic officers. brake suddenly in response to danger resulting in a rear-end collision. 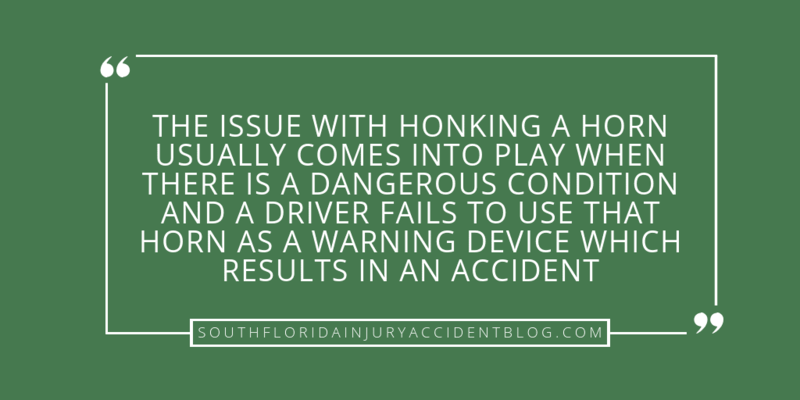 From a personal injury perspective, the issue with honking a horn usually comes into play when there is a dangerous condition and a driver fails to use that horn as a warning device which results in an accident and a serious injury to innocent victims. Horns are required by law because they are effective warning devices. Horns are safety devices first and foremost. A driver doesn’t hit their horn when a pedestrian (child, teenager, elder) is about to walk or run right into their lane of traffic. If you are injured in a motor vehicle accident, then it may be difficult to prove that the accident was caused, at least in part, by the failure of a driver to signal danger with their horn. In these situations, witnesses to the crash may be invaluable because it is usually much easier for a person to remember the failure of a horn signal (”Did you hear a horn honking?” “No, I don’t think I did.”) than other crash circumstances. One reason for this is that car horns sound MUCH LOUDER outside your vehicle than they do when you are inside the car’s interior, hitting that car horn. Insurance companies and insurance adjusters may belittle the fact that the victim didn’t hear a horn honking — but a car crash lawyer will be the first to point out that all too often, that failure to warn means the difference between a near-miss and an actual collision. Did The At-Fault Driver Exceed The Speed Limit or Ignore a Warning Sign?